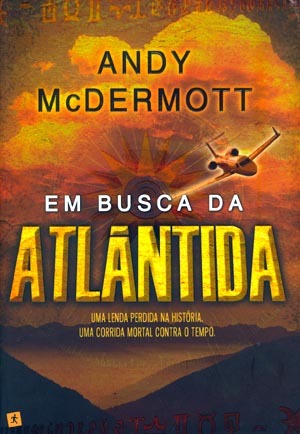 Follow Andy McDermott on Twitter! A belated Happy New Year to you all! As much as I enjoyed it, it has to be said that the Christmas holiday is not especially conducive to productivity, but I'm now back at work editing THE VAULT OF SHIVA. And I really need to crack on, because people seem very keen to get hold of it; its sales rank on Amazon.co.uk today was actually higher than all my other books except for THE CULT OF OSIRIS, and it's not even ready! I love pressure, eat it for breakfast, etc. Letting out a little of the steam was the good news today that THE TOMB OF HERCULES and THE SECRET OF EXCALIBUR have been sold to publishers La Factoria de Ideas in Spain. Compared to the snow in Bournemouth, sunny Spain seems a good place to be right now - as a friend gloatingly informed me via Facebook. 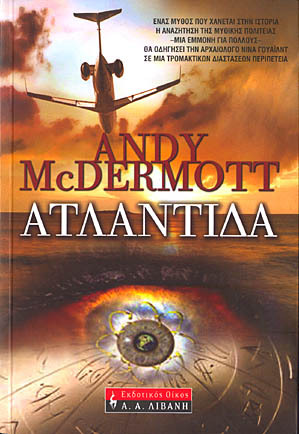 I've also won an award at Megalith: 'Most Underrated Author' of 2009, thanks to my books only recently having been published in the United States. 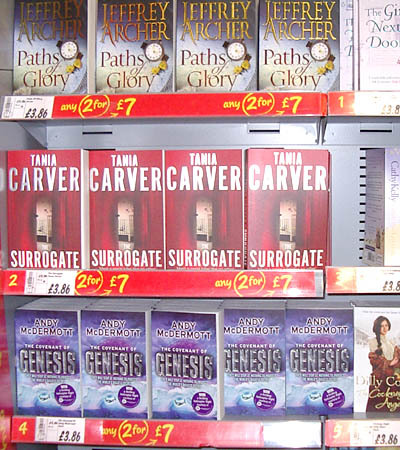 Hopefully in 2010 I'll be up for 'Best Author' - and not 'Most Overrated'! 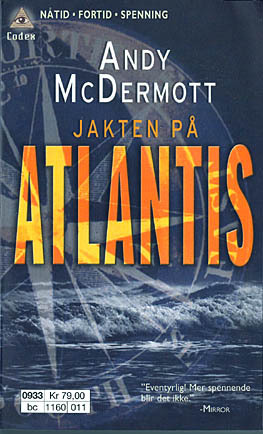 Yet another international sale: this time, THE HUNT FOR ATLANTIS has been sold to Modern Press in China. Which means there will now be two Chinese-language editions; the 'Chinese Complex' version in Macao and Hong Kong, and the 'Chinese Simplified' in the rest of the PRC. Not that I'll be able to understand a word of either of them, but great news all the same! 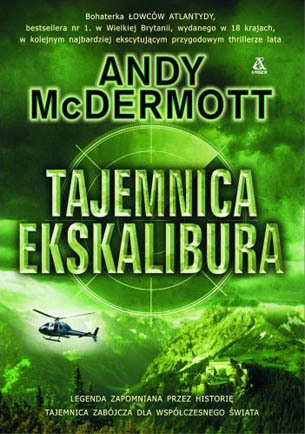 Another quick international sales update: both THE HUNT FOR ATLANTIS and THE TOMB OF HERCULES have been sold to Prosvetno Delo in Macedonia, adding another language to the ever-lengthening list of translations of Eddie's "catchphrase". 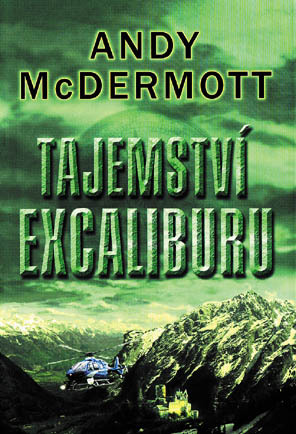 Also, THE SECRET OF EXCALIBUR has been released in the Czech Republic; here's the cover! 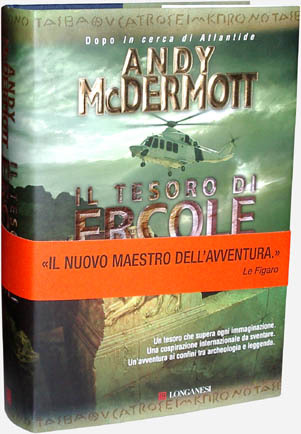 A brief international sales update: THE SECRET OF EXCALIBUR has been sold to Longanesi in Italy (Ciao! to everyone on my Italian Facebook fan page, by the way!) and THE COVENANT OF GENESIS to Amber in Poland. The radio interview yesterday afternoon went well - I didn't freeze, babble or swear, so success! It's available via iPlayer (the 25/11/2009 show) from this page until the end of November. I'm on from the one hour, 37 minutes mark. It was a fun experience, even if being in a studio for the first time was slightly odd; for whatever reason, Charlie the DJ was on one side of a high partition in the studio and I was on the other, so I could only see her peering over the top of it, Chad-style! Maybe the BBC worries about guests leaping across the control desk to attack the turn, or vice-versa. I also had, in the words of those celebrated musical poets Limp Bizkit, a mic pointed at my grille like a gun, so I had to lean sideways to see anything at all round the pineapple-sized cover. It was interesting to see how everything works, though, and I think I came across as far more relaxed and confident than I did on my TalkSport appearance a year or two ago! An update on the McDermott media circus; on Wednesday 25 November, I'll be appearing on the Charlie Crocker Show on BBC Radio Solent, at 2:30pm. It'll be my first time in a radio studio, so it should be an interesting experience - and I'll try to resist the urge to launch into a Frasier impression or say something dorky like "Can I have a bit more top in these cans, please?" If you aren't able to listen to my dulcet tones live, I think it'll be available via iPlayer from the Radio Solent website afterwards. Both THE HUNT FOR ATLANTIS and THE TOMB OF HERCULES are just outside the New York Times bestseller list this week, ATLANTIS having gone back up the charts following the publication of the second book in the US. Fingers crossed for one (or both!) to go higher next week! I've (finally!) reached another milestone on THE VAULT OF SHIVA, having just minutes ago finished the first edit of the first draft, cutting a mammoth 50,000 words out of it. There's still plenty to do, like writing new sections to bridge all the bits that got cut (entire chapters, in some places), but my 'to do' list is down to two pages of bullet points, and by far the most horrible stage of the writing process is over and done with. Which as far as I'm concerned is definitely something to celebrate! News from my publisher that should cheer all those people who've been asking when my novels will be available as ebooks in the UK; THE HUNT FOR ATLANTIS, THE TOMB OF HERCULES and THE SECRET OF EXCALIBUR will be released in electronic format on 12 November, with THE COVENANT OF GENESIS following a week later on the 19th and THE CULT OF OSIRIS on 10 December! As part of a rolling programme of making my website more informative-y, I've updated my bio page, so should you have the urge to learn more about me, click the link to the left. I haven't gone so far as to list such things as my favourite colour, aquatic bird and celebrity bottom, but for the record they are: orange, the mallard and Rachel Stevens'. So now you know! 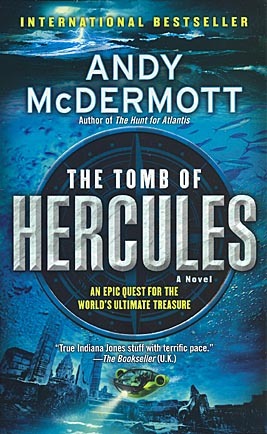 THE TOMB OF HERCULES is published in the US and Canada tomorrow (fingers crossed that it does as well as THE HUNT FOR ATLANTIS! ), and I'm doing a reading at a local book group tonight, so there's a lot going on... but I still haven't finished the first draft of THE VAULT OF SHIVA! It's close, though. Very close. Just the climactic action sequence and confrontation with the bad guys to go, then an epilogue, and I'm done. I can almost taste the champagne! But I've been buoyed up by people congratulating me over the Stateside success of THE HUNT FOR ATLANTIS, which spurred me on no end over the last few days. And for all that parts of the job can sometimes feel a bit of a trudge (you try working seven days a week for eight weeks without a break and see if you can maintain a state of perky enthusiasm! ), overall it's still a fantastic way to earn a living. I mean, I write Hollywood blockbuster-style adventure thrillers - and lots of people all over the world enjoy reading them. How great is that? Some fantastic news from my US publishers - THE HUNT FOR ATLANTIS is officially... (drumroll) ...a New York Times bestseller! Everyone who knows me will probably be heartily sick of hearing about it in very short order, but I don't care, because it's definitely something to celebrate. As I said in the previous update, it's a debut novel by an unknown author, so for it to crack what is probably the most important chart in the States after just a few weeks on sale is really quite mindblowing. To mark the occasion, I've decided to give this Twitter thing a try, so if you want up-to-date (ish) news about what I'm up to, visit my Twitter page. I'll try to keep things interesting and related to my books; I doubt anyone would care about the timing of my coffee breaks or what I'm watching on TV! Damn, seven weeks in - and still not finished! After 49 days of solid work, THE VAULT OF SHIVA has passed the 150,000 word mark, which is 25,000 words over what it's supposed to be. 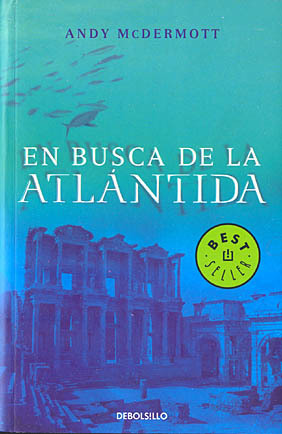 But t'was ever thus; looking back at my notes, the first draft of THE HUNT FOR ATLANTIS was 160,000 words long, THE TOMB OF HERCULES 154,000, THE SECRET OF EXCALIBUR 168,000, THE COVENANT OF GENESIS an argh-inducing 209,000 and THE CULT OF OSIRIS 163,000. So even when I set out saying "This time, I'm going to keep the length down to a reasonable size" I still can't manage it! On the plus side, it means there's more I can cut - and the more fat I trim away, the leaner and tastier the end result. Literally, in this case. My publisher sent me these photos from New Zealand, where my books are apparently doing really well; having giant adverts cruising around the place must certainly help them get noticed! Then once she and Eddie get through that, a deadly Hindu goddess awaits them inside, and even if they can outwit her, there's a small army of bad guys on their tail... Still, if their lives were easy, it wouldn't make for very exciting books! Happy birthday to me! Looking back at the old news pages, I see that two years ago today I had just signed the contract to write books 3 and 4. I'm now hard at work on book 6 - a lot's been done in those two years! I'm still keeping up to my 3000 words a day target as I write THE VAULT OF SHIVA (even with the distraction of the Grand Prix at the weekend), but this week was one of those annoying times when no sooner had I finished writing a big chunk of the story than I realised I'm going to have to junk it. An action sequence (or rather, a series of them, where Nina and Eddie have a frying pan/fire/surrounded by landmines/in a bigger fire progression) ended up just getting too big, lasting over five chapters before they finally escaped. Even as I was writing I knew it was running far too long, but I pressed on because I couldn't think of a way to get them out of it sooner, and also because the end of the sequence gave one of the secondary characters a chance to show off their badassery. Literally within five minutes of my ending the last chapter, though, I worked out a way to cut the entire sequence by at least a quarter, and how to move the character's big moment to an earlier part of the story. Now why the hell couldn't I have thought of that before I started writing the novel? Oh well, at least now I know how to fix it when I start editing! 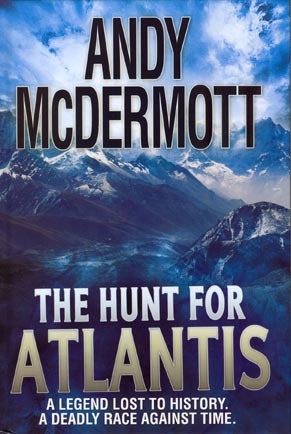 However, bigger news is that tomorrow - 29 September - marks the long-awaited North American publication of THE HUNT FOR ATLANTIS! As well as the paperback, it's also being released in new-fangled ebook formats, so if you fancy saving some trees you can read it on your Kindle or iPhone or Blackberry. Fingers crossed that it does as well over there as it did over here! As a sidenote, I'm currently checking the final final proofs - the actual printed pages as they'll appear in the book - for THE CULT OF OSIRIS... and damn, I'm really enjoying the story! I know I wrote it and so should know exactly what happens, and have read it more times than I care to remember in the past six months, but for some reason reading it as a novel rather than a bunch of unformatted, double-spaced A4 pages really puts it in a new light. I have to keep reminding myself that I'm supposed to be scouring it for typos, rather than actually getting caught up in the narrative. Which is hopefully a good sign if even the jaded author can't stop turning the pages! Dan Whooo? The Lost Whaaat? A new Dan Brown? Pah! 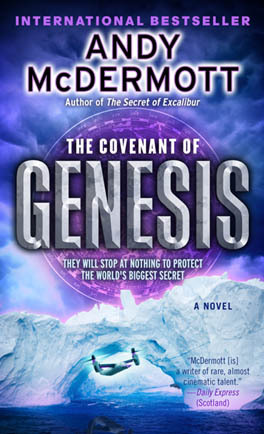 Far more important news this week (to me, anyway) is the UK paperback release of my fourth novel, THE COVENANT OF GENESIS! It's already at #4 in the Asda chart (see pic), and as I write steadily rising into the upper reaches of Amazon.co.uk's sales rankings, so this could be the biggest Nina and Eddie adventure to date. Since the next couple of months will see a flurry of activity with THE HUNT FOR ATLANTIS and THE TOMB OF HERCULES coming out in North America, and THE CULT OF OSIRIS hitting British shelves in November, I thought it was time to update the front page as well, which hopefully you've seen. Too brash? A bit blunt? Meh, my novels are hardly known for their subtlety! Two weeks in, and I'm still ahead of my daily wordcount target by a small (but growing) amount, as well as being more or less as far along in the story as I'd hoped to be. It's going well! I did, however, have to do something I normally wouldn't while writing the first draft: go back and change something. My usual approach at this stage is "never look back", working at full speed without doing any revisions until the whole thing is finished. This time, though, I'd finished a chapter and happily moved on to the next, getting engrossed in another of my trademark mega action sequences... when I suddenly realised that I had somehow completely forgotten to write an entire section utterly vital to the plot! That was a real head-smacking moment, and this time I had to backtrack and add it in. It'll hopefully teach me to check the synopsis before I start work for the day, I suppose. I've decided to do a weekly(ish) progress report on the writing of THE VAULT OF SHIVA, so anyone interested can see how the much-vaunted "creative process" works. (In my case, it involves a lot of coffee and trying to think up synonyms for "punched", "shot" and "exploded".) But I'm slightly ahead of my usual 3000-words-a-day target - very slightly, but ahead is still ahead! - and getting stuck into the book's second big action sequence as I lay waste to another major American city. I love my job. Although there's one part of it I love considerably less than others, and that's checking the final proofs, a drudge of a task at the best of times... and nightmarish when you have to do it all over again from scratch. Why do I have to do that? Because it looks like the bloody Royal Mail has lost the first set! (Insert fist-shaking emoticon here.) A replacement is on the way from Headline, so unless Postman Pat can pull a miracle out of his sack I'll be spending the next several evenings after I finish writing for the day going through a 460+ page manuscript page by page, line by line, word by word with a red pen, trying to remember all the changes I made the first time. Joy! On the other hand, if I'm working more, I'll be drinking less, so there's a silver lining in there somewhere! It's a bank holiday today, so I'm having a day off and taking things easy... in preparation for tomorrow, when I get back to work. Yes, I'm finally ready to start writing Nina Wilde and Eddie Chase's sixth adventure, THE VAULT OF SHIVA! It's taken a couple of months longer than I hoped, for various reasons, but everything is now planned out and ready to go. The action this time takes place in Italy, Nicaragua and India, to name but a few of the exotic locations, and I'm really looking forward to writing it. I'm even going to try something a little different; while there'll be, as always, loads of action, one sequence will be heavy on... suspense. Shocking, I know! How will my fans react? Incidentally, I recently found out that I have fans, with groups and pages on Facebook! So hi to all of you, and I hope you keep on enjoying my books. I might even drop by sometime! Two new international covers to show off - the North American editions of THE SECRET OF EXCALIBUR and THE COVENANT OF GENESIS, which both come out in early 2010. As you can see, the GENESIS cover is almost identical to the UK edition, but the one for EXCALIBUR is very different - and also very striking, I think! It'll be a few weeks before I can start writing it, but planning is well under way - I spent today working out the details of a spectacular opening sequence in which one of the world's greatest art treasures is stolen. All I have to do now is make sure that everything that follows is even more thrilling - and with the story I've devised, I think it will be! A shorter update than last time, for which you may well be grateful! 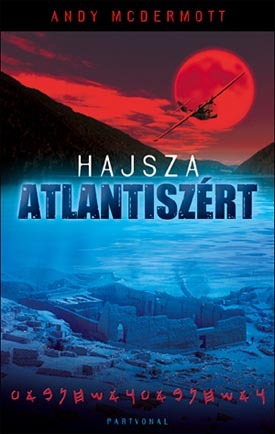 Firstly, here are two new international covers: the Greek and Spanish (paperback) editions of THE HUNT FOR ATLANTIS. I take it from the flash on the cover that the earlier trade paperback of the Spanish version was a bestseller, which is great! I've given a synopsis of Book 6 to my editor, and she likes it, so when all the final details are worked out I should soon be able to start writing it. If Headline approve the working title (it follows the series format of THE [SOMETHING] OF [SOMETHING], you probably won't be surprised to learn...) I'll announce it here shortly! 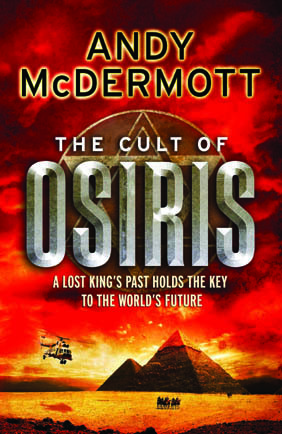 Incidentally, following on from the previous update, Headline sent me a copy of the glossy publicity pack they'll be using to promote THE CULT OF OSIRIS and the paperback of THE COVENANT OF GENESIS in the autumn, and according to that my conservative estimate of a quarter of a million sales worldwide was actually quite a bit short! So, half a million sales is my next big target... wow! It's funny how sometimes, the most mundane things can make you all contemplative. Tomorrow, I'm having my living room and bedroom carpets shampooed (as I said, mundane) - but since I live in a small flat, my living room and bedroom between them comprise about 75% of my floorspace, and much of the remainder is occupied by stuff like, you know, baths and cookers and fridges. This made moving my belongings around so that the cleaners can actually see the carpets quite a challenge. So inevitably, what started as a reshuffle soon turned into a throw-out. And one of the things that ended up going was... this. What's that, you may ask? 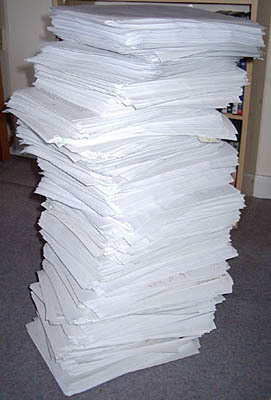 That is something like 4000 pages of A4, standing the better part of three feet high and weighing enough to need three trips to the recycling bin. (Did I mention that my flat is on the top floor? And the building doesn't have a lift? And it's really hot today?) It is also the printouts of every draft of every novel I've written - not just the five Wilde/Chase stories to date, but all the others that never made it: Manta, White Van and The Nexus Imprint, to name but three. Pretty much a decade's worth of work. And, after the aforementioned contemplation, I chucked it all out. Now, if you're reading this on some Internet archive via HoloGoogle in the far future and reacting in horror to the idea of one of the 21st Century's best-selling novelists (who famously died smiling in bed aboard his private jet at the age of 97 in the company of many beautiful ladies) throwing out all those papers that could have been the centrepiece of the Andy McDermott Memorial Library & Wine Bar, I apologise. But it did make me think. Initially I was going to keep the lot and just move them out of the way, then I was only going to keep the first drafts... and ultimately I decided to get rid of them all. I'm not unsentimental; if I were, there wouldn't have been a middle step there. But it struck me that the various drafts aren't the originals, in the way they would have been when I first learned to type on my mum's old manual typewriter and a rubber-keyed ZX Spectrum. (Showing my age, there.) The originals never existed physically, only as digital files - the three feet of pages are just glorified notes, intermediate pupal stages of the developing stories. So long as I keep them backed up, I can re-read the earlier drafts whenever I like. The only paper versions that ultimately matter are the ones that you, the reader, can hold in your hands. And those are going to stay around longer than any printed drafts I might have chosen to preserve. I found out yesterday exactly how many copies of my books have been sold in the UK - I won't give the exact figure, because my publishers will be cross and tell me off, but suffice it to say that for a guy who barely a year and a half ago was totally unknown, it's good. It's "Holy crap!" good. But by taking that number and doing a bit of back-of-the-envelope maths to add the numerous international editions, even at the most conservative estimate I reckon I've sold... over a quarter of a million books worldwide. Yes, I was fairly gobsmacked too. But it means there are a lot of people all over the world who like my books, and it also means, in a roundabout way, that my carpets will be cleaner tomorrow. And both those things make me happy - though obviously, one more so than the other! Great news! The Dacia Sandero... no, wait, that's Top Gear. This is even greater news - Bantam Dell have just bought the North American rights for another four of my novels. That's THE CULT OF OSIRIS, plus another three that I haven't even started writing yet! (I was planning to have begun Book 6 by now, but... well, maybe I'll tell that story further down the line. ;) Just to add to the celebrations, the revisions of OSIRIS itself are now complete and it's been accepted for publication by Headline. Yeah! 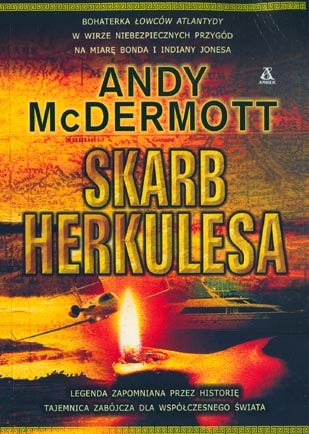 Also, here is a triptych of international covers: the Norwegian edition of THE HUNT FOR ATLANTIS, the Czech THE TOMB OF HERCULES and the Polish version of THE SECRET OF EXCALIBUR, all looking rather sharp! Winging my way from Italy is the Longanesi edition of THE TOMB OF HERCULES, which like their cover for THE HUNT FOR ATLANTIS is very stylishly done. From the country that brought us Armani and Ferrari, I'd expect nothing less! Because I liked it so much, I've put up two versions here - the flat artwork and a photo of the book itself, complete with a cover band proclaiming me as "The new master of adventure". Yep, I'm pretty happy with that! 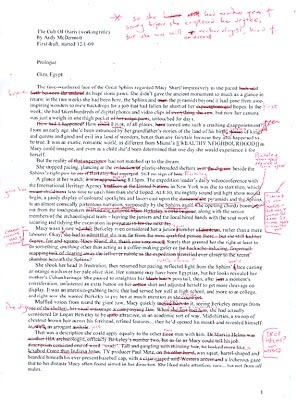 The inactivity on this page for the last week and a half is the result of plenty of activity elsewhere; I've been working on what should hopefully be the final revisions to THE CULT OF OSIRIS after getting my editor's notes. There wasn't anything major to be done, just tightening some scenes, spreading out exposition so it didn't hit the reader like one giant falling boulder and making poor Nina and Eddie have an even worse time in their personal lives! I'm almost finished, but I might have one last read-through and see if I can slice out an extra thousand words. Another tree saved! On a sidenote, being an author has its perks (such as being able to reply to the question "And what do you do?" with a Roger Moore-style smug smirk and raised eyebrow as you answer), but I found out today that it also has its drawbacks: namely being regarded by large corporations as penurious and untrustworthy for the crime of (gasp!) being self-employed. My old cheapy-cheap mobile recently packed up, so I decided to treat myself and splash out on an iPhone contract. Doing so required a credit check, which went fine until the part where I had to give my occupation. Sirens and flashing lights went off (metaphorically; phone companies aren't that obnoxious... yet), and the end result was that for the privilege of giving O2 money every month for the next two years, I was expected to furnish a deposit so large that I could have bought an iPhone outright. Thanks, but no thanks. So now I'll just blow the grand that would have gone into O2's pockets on blackjack and hookers (metaphorically), and pick up another cheapy-cheap phone from someone else. Maybe I'll go with Orange. Since they sponsor assorted literary endeavours, they're hopefully a bit more friendly towards authors! The new sales charts are in - and I'm in them! THE SECRET OF EXCALIBUR hit #19 in the latest paperback chart, and #25 in all books sold in the UK, which I'm pretty pleased about. It was also #4 in the Asda and #6 in the Tesco charts, and since those two supermarkets between them account for a pretty hefty percentage of all paperback sales those are extremely nice positions to be in! Another short update, this time to show off the finished covers for the North American editions of THE HUNT FOR ATLANTIS and THE TOMB OF HERCULES. They're similar to the UK editions, but different enough to stand apart, and though you can't really see it here they're finished with a glossy varnish and the titles are embossed in the card. I think they look absolutely fantastic, so well done to everyone at Bantam Dell. Can't wait to see them actually wrapped around the finished books! Nothing like a bit of good news to brighten the day! 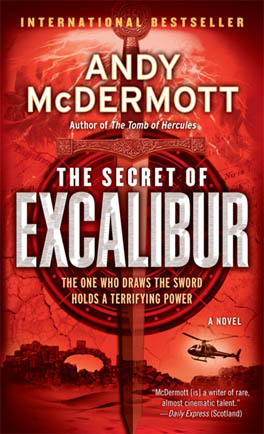 THE SECRET OF EXCALIBUR entered the UK's top 50 books at #43, one place behind a book by some chap called Obama. The name rings a bell; I think he may be Irish. And that position was achieved after only its first three days on sale, so hopefully in the next chart, with a full week of sales, it'll go even higher! Since I have two new books out tomorrow (well, they're actually already on sale in many places, but tomorrow is the official publication date), I thought it was about time I updated the site's front page! You've probably already seen it, unless you're one of those people who comes directly to this page and denies my hit-counter precious nourishment. In which case, click on 'HOME' to the left and feed it. Now! Also, don't forget to vote for me at Megalith on 15 May! A short updatelet to tell you that I'm the Author of the Month at Australian/New Zealand/Hong Kong bookstore chain Dymocks! Read the interview with me here. Blimey, over a month without an update. No, I'm not dead, I've just been really busy! So what's been going on? Well, THE TOMB OF HERCULES and THE SECRET OF EXCALIBUR have both been sold to Bulgaria (good), I was a victim of credit card fraud (bad), my credit card company thought the activity on my account was "suspicious" and froze it before too much damage was done (good), Monkeyman is gone (only people who know me personally will understand what that means, but trust me, it's very good) and I've finished the rewrites on THE CULT OF OSIRIS (very, very good). So on balance: a positive month! So for the next week or two I'll be busy with one final polish of OSIRIS before I deliver it to Headline, which will bring me neatly up to the release of the paperback edition of EXCALIBUR and the hardback and trade paperbacks of THE COVENANT OF GENESIS on 14 May. Which I still find somewhat weird - since November 2007, less than a year and a half ago, I've had four novels published. No wonder I haven't had time to take a holiday! 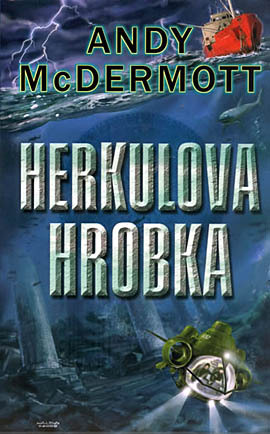 A couple more new covers: first is the Polish edition of THE TOMB OF HERCULES, and the second is one that won't be for sale (though I have no doubts that copies will appear on eBay at some point) - the 'preview' edition of the North American edition of THE HUNT FOR ATLANTIS, which will be going out to reviewers in advance of its publication in September. I hope they like it! I'm still bashing away at THE CULT OF OSIRIS; the first three chapters have been heavily rewritten, and next on the agenda is a later chapter that I knew even as I was writing it would need major reworking, because everything was just too easy for the good guys. I've also, to my dismay, realised that I'm almost certainly going to have to cut a scene that was in my mind for the story right from the very beginning. It's a shame, because it's a wild, funny sequence, but the setup is a little bit too convoluted to be believable, and the end result can be achieved in a much simpler (and shorter) way. So that's one Roger Moore homage that'll probably never see the light of day... unless I can figure out a way to work it into a later novel! 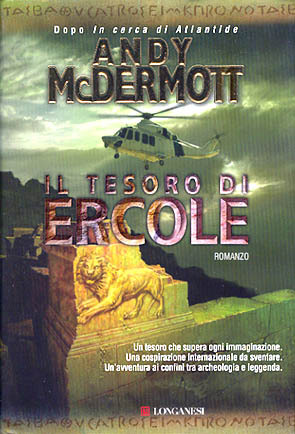 More foreign sales news: THE TOMB OF HERCULES and THE SECRET OF EXCALIBUR have both been sold to the Czech Republic! Woo! The first draft of THE CULT OF OSIRIS is finished! More or less. Anyway, I now have a 191-page, 145,000-word printout sitting beside me that needs about 25,000 words cutting out, along with an additional three-page printout of things I need to change, remove or add during the editing process. That's a lot of bullet points. But still, completing the thing in 48 days is pretty good going - and I even managed to meet my self-imposed target of 3000 words every single day. Next step: crack open the champagne! A quick pre-emptive apology to anyone who's emailed me recently but not heard anything back; I've been so wrapped up with work on THE CULT OF OSIRIS (and also checking the final proofs for THE COVENANT OF GENESIS, which arrived a week ago) that I've been neglecting my inbox. I'll get back to you soon, I promise! Speaking of both those books, I had a pleasant surprise when I saw this morning that the trade paperback of COVENANT was in Amazon's adventure stories chart - three months before it even comes out! That's got to be a promising sign if the pre-orders are that strong... OSIRIS itself is progressing well, as I'm now writing the penultimate action sequence (from which this update's title is derived - though dune buggies are the least of the vehicles involved). As usual, by this stage - 43 straight days of work - I'm feeling the grind a bit and finding more ways than normal to procrastinate. Make another coffee! Have a biscuit! Go for a walk! Check the news! Look up how my books are selling on Amazon, for the 15th time today! Still, knowing that my traditional celebratory bottle of Piper-Heidsieck Red Label (already bought) will soon be popped pepped me up quite a bit today, as did the knowledge that some spectacular bad guy deaths are on the way! The still-unnamed Book 5 is coming along very well, dead on my 3000-words-a-day target, with Nina and Eddie just arriving in Monaco... while the Grand Prix is being held. What a coincidence! Chances of the race being disrupted in some outrageous way: pretty high. To all the people in North America who've emailed me asking when they'll be able to buy my books without trading a kidney to Amazon for a UK export copy: I now have an answer! 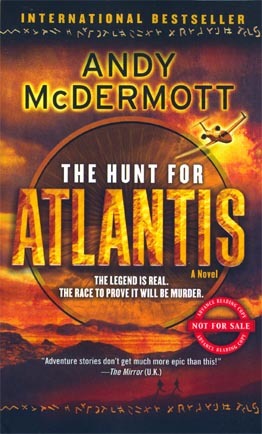 Bantam Dell will be publishing the US and Canadian edition of THE HUNT FOR ATLANTIS on 29 September, and following it less than a month later with THE TOMB OF HERCULES on 27 October. THE SECRET OF EXCALIBUR and THE COVENANT OF GENESIS will have a similarly rapid-fire release schedule in Spring 2010. Mark your diaries! For once in my life, I can truthfully say that things are going exactly to plan. That plan was to write 3000 words of Book 5 every day; I've just wrapped up work for the eighth day and my word count is near as dammit exactly 24,000 words. Precision! "[CHARACTER NAME] HAS TO DIE!" It won't be the first time I've killed off a major character in something I've written - but it's the first time I've realised so far in advance that I'm going to have to commit literary murder. And it also means I'll have to be careful while writing this character in the meantime not to give anything away or change how I portray them: I might know that he (or she) has the Sword of Damocles dangling over them, but she (or he) has to remain blissfully unaware! So who is doomed? Not telling! I haven't even yet worked out the specifics of where and how, but I do know the situation that leads to his/her death... and at whose hands. Ominous, huh? Maybe even worthy of a sinister "Muwah hah hah!" We're Running Out Of Time! Nothing whatsoever to do with my writing, but... 24 is back! I was absolutely shocked when I worked out that since I last saw a new episode (the 'Redemption' TV movie last year didn't count :p ), I'd had three novels published. While in theory I obviously supported the US writers' strike that caused this season to be delayed for a whole year, in practice... I had to wait 18 months for new 24, dammit! Ahem. Anyway, the first two episodes of Day 7 were on Sky last night, and today I watched the next two by, er, other means. (Come on, I wasn't going to wait a whole week. We're not in the Dark Ages of the 20th Century any more.) So far, the way the Bauer Bingo card is filling up, it's as if the writers are well aware of the show's cliches and are deliberately including them right up front for laughs. Mole? Check. Perimeter set up, then easily breached? Check. "He's our only lead!"? Check. Jack screaming "TELL ME WHERE THE [MACGUFFIN] IS!" into someone's face? Check. Unfortunate Bauer fashion choice (this year, a flasher mack)? Check. Yet despite this, I still watched all four episodes with a big goofy grin, just because I was so stoked to have it back. I've been a huge fan of 24 right from the start, even though its quality has ranged from awesome (Day 5) to awful (Day 6) and it's utterly ridiculous if you spend so much as a second actually thinking logically about the plot, because it so effortlessly manages to be something that few TV shows are: thrilling. And as you'll know if you've read my books, I'm all about the thrills... So welcome back, Jack. Long may you continue to torture, chokehold and turn common household objects into deadly weapons! A little behind-the-scenes factoid about Book 5: it was originally going to be Book 6! I had a completely different story planned for Nina and Eddie's fifth adventure, until I learned that one of Headline's other authors was working on a novel using the same ancient legend as its background... and his would be published a few months before mine. D'oh! So it was a good job I'd been planning ahead and had another story idea in the works - and that I found out early enough to change things! Another year, another blog-y news page! Should you want to learn what I was doing in the previous two years, there are links to the old ones below. As for what I'm doing now, I'm getting ready to start writing the fifth, as yet untitled Nina and Eddie novel! The story is more or less worked out; I've just got to finalise some of the action scenes (including the minor detail of the climax to the whole thing...) and I'll be good to go. I did actually want to be ready to start today, which would have been three years to the day after I started writing THE HUNT FOR ATLANTIS, but there was no point rushing things just to meet some arbitrary anniversary. Besides, my flat's too bloody cold to work in today!